I just had the opportunity to review the newest release, It's Lovin' I Guarantee from Gus Spenos and it's jumping. 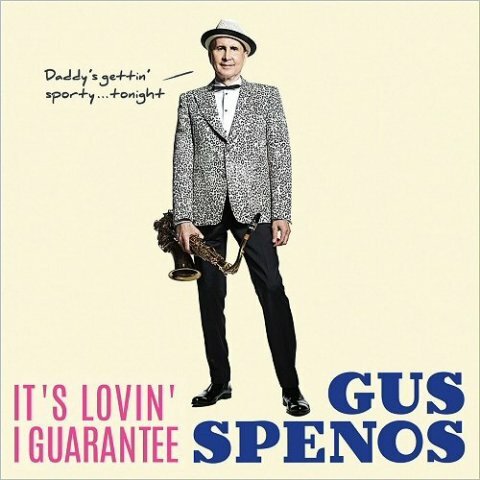 Opening with title track, It's Lovin' I Guarantee, Spenos leads the way on vocal and tenor sax. Backed by Wycliffe Gordon on trombone, Corey Wilcox on trombone, Freddie Hendrix on trumpet, Tatum Greenblatt on trumpet, Walter Blanding on tenor sax, Bruce Williams on alto sax, Jason Marshall on bari sax, Chris Burger on bass, Cecil Brooks III on drums and Brad Williams on guitar, these guys are really moving. Fool's Blues is a sassy swing number with some real nice sax and trombone solos. With trumpets firing, Every Tic's Got A Toc has a great feel. Spenos lays down some stylized sax work and Hendrix hits the trumpet solos full on. I really like Williams' tight guitar riffs on Livin' Is A Crime and again Hendrix shines on trumpet. Sax work on Lil' Dog is fast and fluid making it one of my favorites on the release. Wrapping the release is full blazing horns on Got Myself A Diamond with all saxs pumping. Marshall and Hendrix trade solos and backing vocals by Wincey Terry-Bryant, Audrey Shakir and Renee Collins Georges cap it off.